Ch. Rista Sequel Tru Blu Cowboy, NA "Cowboy"
Ch. 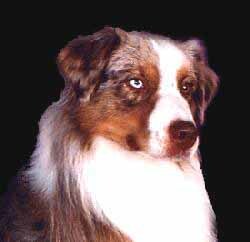 True Colors by Sirius, ROM "Dallas"
Dallas was our foundation sire and he passed away on April 15, 2006. He will be greatly missed. He was my "ultimate" red dog. Rest in peace sweet boy until I see you again on the other side. Rista and Sequel formed a partnership to fully enhance our breeding program and to produce top quality Aussies. James Shannon of Sequel Aussies passed away in 2002. He will truly be missed by all that knew him. Jim was my mentor and good friend. I will truly miss him but his legacy will live on with Rista Aussies. 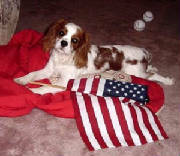 Our dogs have wonderful temperments, as well as outstanding movement. We believe in breeding only the best! Our dogs are OFA and CERF (eyes) yearly. This is our bred by Dallas grandson and Cowboy and Peaches son. He's our first BIS dog. We are sooooooo proud of him. THANKS to Tanner and Cherry for all your hardwork and dedication and for taking this dog to the top!!!! Not only did he get 1 BIS the next weekend he gets his 2nd!! WOW!!!!!!!!!! 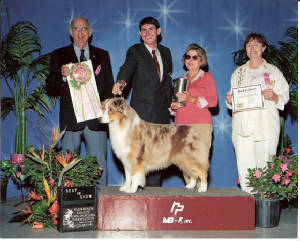 Rista Cavaliers was started in 2000. It was love at first site when I saw these charming dogs. Their intelligence and loving nature sold me instantly and I knew I had to have one so my mom and I decided this would be the breed we would do together.